It’s quite difficult for me to write this review of The Answering Machine’s second studio album Lifeline. Not because it doesn’t live up to my expectations but because when I think about it all I feel like doing is inching next to it, blushing and telling it sheepishly that I really really like it. Yep, I’ve got a proper crush on Lifeline. It’s wonderful. Less full-on than the guitar driven than debut Another City, Another Sorry The Answering Machine have built on what they started and have done nothing less than create an album of exquisitely crafted pop songs. It’s all executed perfectly and with a heart the size of Kanye’s ego. The production is top notch too, leading to many moments across the 11 songs that are definitely worth writing home about. ‘My Little Navy’ opens Lifeline and showcases immediately the evolution that’s occurred in the band between albums. The prominent bass backs the twinkling keyboards whilst drum rolls travel between left and right and the lyrics talk of wreckage and lighthouse. Following this we get the perfect double bill of ‘Lifeline’ and ‘Animals’: both previous Tracks of the Week and both sublime. They’re master classes in classic songwriting and suit the analogue recording that lends proceedings a timeless feel and expansive sound. ‘Romantic And Square’ gives us yet another different side to The Answering Machine. Combining live and digital percussion it’s closest to ‘It’s Over! It’s Over! It’s Over!’ from the debut than anything else, whilst the fuzzy guitar line makes it a dead cert for future single release in my opinion. On the complete flipside to this ‘The End’ bizarrely showcases a more dub influence, with the overflow of bass sound present in the drum track. Fronted by bass player Gemma it’s certainly new ground for the four-piece, but kept in line with the rest of Lifeline by the epic finish and close vocal harmonies. Despite all the initial brilliance there’s one or two tracks that take a little longer to sink in. ‘Video 8’ seems superfluous on first listens until repeat plays allows it to reveal itself and cohere with the lyrics. Along with ‘Hospital Lung’ it betrays a tendency by lyricist/singer Martin to emphasise detachment through the use of technology metaphors. Still, it doesn’t seem as if the band are trying to make a grand statement and everything is always grounded in the personal and (as Lifeline has been soundtracking my commute since it arrived) extremely relatable. Although epic, Lifeline doesn’t shy away from delicate acoustic moments. The tracks and flourishes are backed by drum machines and glockenspiels, ensuring that they have all the naïve charm of Athlete’s excellent debut. Elsewhere, the nearest comparison is to The Pains of Being Pure at Heart for the use of vintage keyboards and achieving skyscraping, heart-on-sleeve indie perfection. 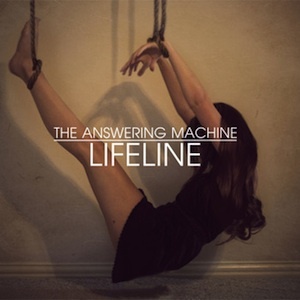 Basically, The Answering Machine have created a fantastic record, and specifically one that I'm not really good enough to review accurately. Just check out 'Anything Anything' and then tell me that Lifeline is anything less than utterly spectacular.